21. Vigipirate? What is it? Many find this blog looking for the keyword Vigipirate. So, by request, here are a few infos about that famous security program, its functioning and about the recent changes that have been announced by the government. The first version of the plan was created in 1978, during the presidency of Valéry Giscard d’Estaing. The context, evidently, is international terrorism and the fear of illegal migration, more importantly its seemingly uncontrollable nature. The goal of Vigipirate, quite logically, is the protection of the people, of the territory, of the critical infrastructure (health care, transport, energy supplies etc.). The program associates not only public authorities, but also citizens to the requirement of vigilance (hence the name of the program). The protection of French interests abroad (like embassies) is also a goal of this program. Vigipirate has several operational levels put into place according to the seriousness of the percieved threat – authorities step one to two levels up or down when the goverment deems it necessary. Many know the Vigipirate color scheme that had been in use up until February 2014. It was introduced in 2003, certainly because that was the first period that the problem of international terrorism found its way to the attention and to the everyday life of ordinary citizens. It is not hard to notice the relationship between the 9/11 attacks, the Iraq war, and the modifications of the Vigipirate program (since 2004, by the way, the third, red level of the program was almost constantly in use, showing a relatively high level of danger). But Vigipirate is not only a simple security program: it is also a guarantee that the subjective sense of security of citizens is maintained. It somewhat soothes the nerves of the French, in fact. The plan was activated for the first time in 1991, during the first Iraq war. The second time it had to be activated was in 1995, on occasion of the Paris metro bombings. The functioning of the program has not been suspended since 1996. Vigipirate: how does it work? As I said before, this color scheme was created in 2003. 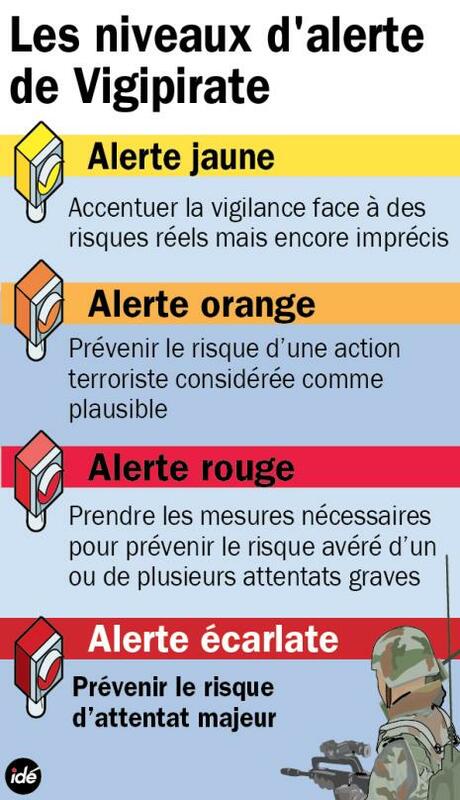 Since 2004, the red level was active almost constantly – the scarlet level, that predicts an attack of huge impact, was activated only once, in 2012, during the electoral campaign (after the Toulouse shootings, also known as Merah affair). At the beginning of 2014, the government announced that it would modify the program and its functioning. As the red level was active for almost a decade, the government decided to put an end to the color scheme. Because of this fact, the new Vigipirate program contains only two levels: the first one is called “Vigilance”. It adresses threats that are diffuse, by implementing roughly 100 measures that has to be in place permanently. The second level is called “Attack alert” – it contains another 200 measures to address concrete risks and concrete attacks. 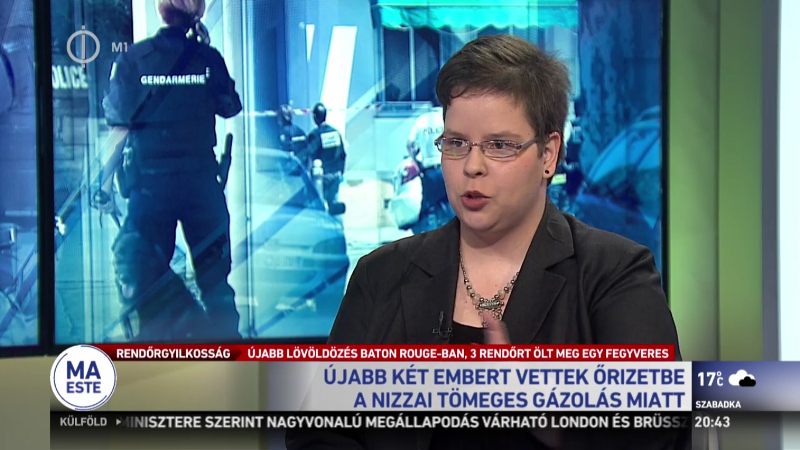 These measures are temporary measures, to be implemented when an attack is imminent or has already happened. So, if one of you is in France, and see this logo, know that you should not be (very) afraid. It only means that the first level of the Vigipirate plan is activated, which is almost always true. In this case, you might see policemen and soldiers on the streets, but you have nothing special to do. Of course, if you see an abandoned bag somewhere in the metro, go and tell security! Those who want to know more about the plan and about the measures in place, can check out the situation on the Internet. The plan is made up of two documents, describing the measures in place. One of them is classified, sent only to the competent persons. But there is a public document as well, regularly updated on risques.gouv.fr. If you are interested, go and download it. Click for you free copy of The Survival Guide to 2017 France report! 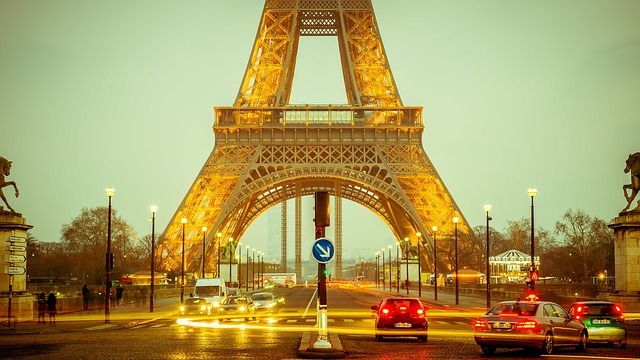 France is a huge but special market, you need to be really prepared to successfully enter it. You might use the same words as your French partners, but are you sure that their meaning is the same?